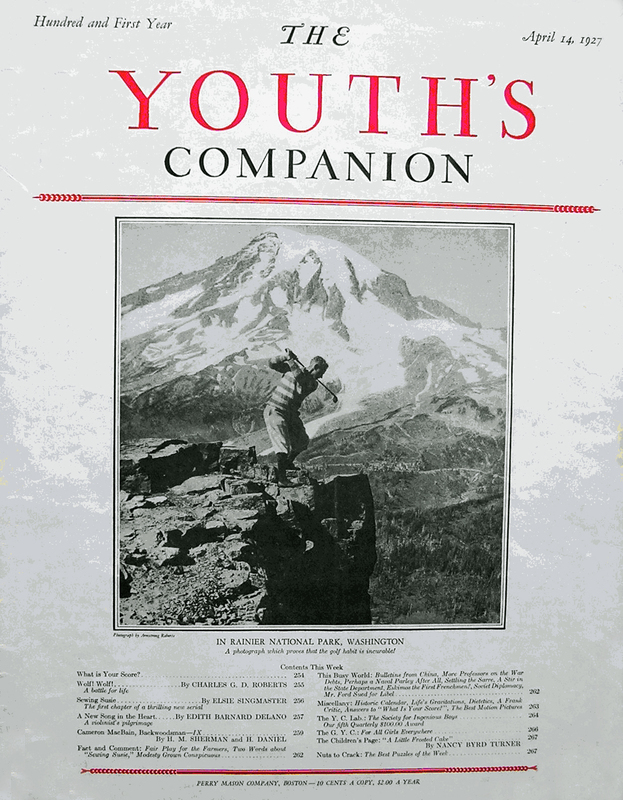 Like something out of Loyal Chapman’s fantasy golf holes, the image on the cover of the April 14, 1927 issue of The Youth’s Companion magazine appears unreal. 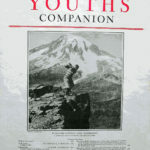 It depicts a young man teeing off a precipice facing Mount Rainier, located 85 miles from Seattle, Washington, and rising to some 14,000 feet above sea level. Is this for real? How long was that drive? Did he make par? 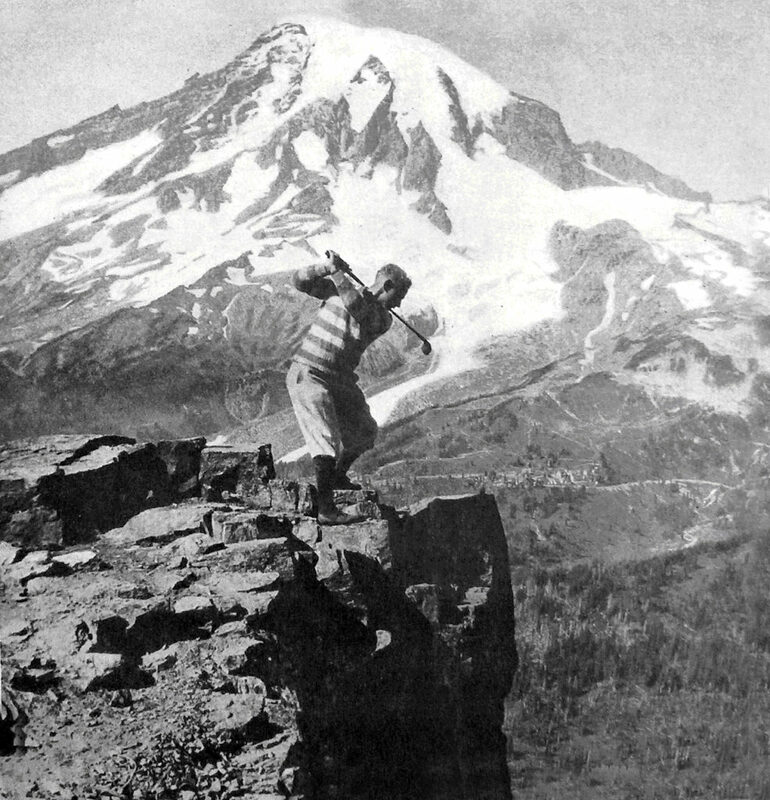 Alas, no such golf hole existed on Mount Rainier in 1927. This was a staged photo opportunity. 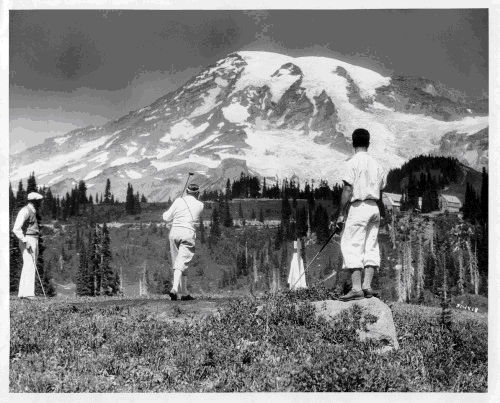 Yet, sometimes life imitates art, and in 1931 a nine hole golf course was indeed built on Mount Rainier. The Rainier National Park Company, which had a concessionaire contract with the U. S. National Park Service, opened the course on August 8, 1931. Named Paradise Golf Course after the nearby Paradise Valley, the course at that time claimed to be the highest in America at 5,500 feet above sea level. The 9-hole golf course, one of the most scenic in America, is located a short distance from Paradise Inn. Every green and tee offers a striking mountain scene and is also a test of golfing skill. Players are transported free from last hole near Marmot Point back to No. 1 tee. Equipment on sale in caddy house at standard prices. Light refreshments also on sale. While the golf course enjoyed a brief popularity among the curious and the ardent, this was the beginning of the Great Depression. The number of visitors to the National Park dropped precipitously and the number of players dwindled. In addition, the season was exceedingly short. Snow would blanket the course by early October. Two short months after it opened, the Paradise Golf Course closed, for good. It had been doomed from the start. The fairways and greens soon returned to the alpine meadow that once defined the landscape.